Blog » Champagne & Sparkling » Grower Champagne » Two IWC Awards for Lea & Sandeman – Celebrate with us! 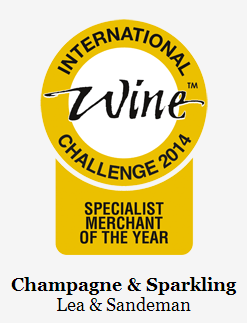 Celebrate the Champagne & Sparkling Wine win with us! We were absolutely delighted to win Specialist Merchant of the Year Award for Champagne & Sparkling Wine. As you our customers will know, not only are our ‘shelf’ prices for Champagne consistently competitive, but also our low ‘case prices’ on Champagnes can almost always be enjoyed on the odd bottle mixed in with a case of other wines. No doubt our faith in Champagnes from smaller grower producers like Barnaut, Legras, Larmandier-Bernier and Egly-Ouriet has played a part. To help you Celebrate this win with us we are offering special prices just to the end of the month of July on the Champagnes listed below. All of these are at least £2 per bottle off the normal case prices. Remember – you don’t have to buy a case of Champagne – if you are ordering a case (12 bottles) of any wine, including the Champagne, you qualify for these prices. EGLY-OURIET Tradition Brut Grand Cru Ambonnay £44.95 single bottle, down to £37.95 ‘case price’. If you want to buy an effortless mixed dozen Champagne to taste you way through, look no further than the selection in this attractive mixed case.